Welcome to this wonderful single story interior location in the city of Cerritos. This home has not only been cared for but upgraded throughout. Composition shingle roof and white dual paned windows with shutters and blinds. Remodeled kitchen with wood cabinetry and granite counters, 3 cabinets with pull-out shelves, lazy susans, and pull-out trashcan. 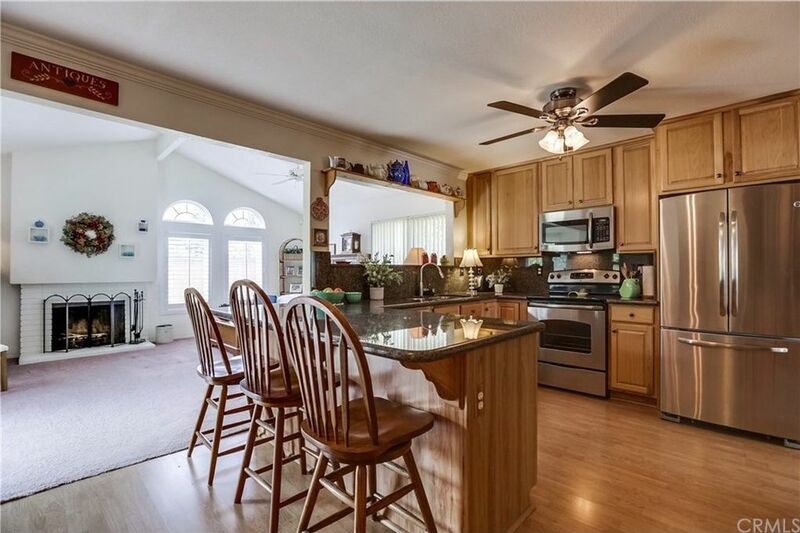 Large island perfect for serving or informal dining (seats 4-5) & stainless steel appliances. Wood laminate flooring and neutral carpet throughout. Bathrooms are upgraded with new fixtures, tile, and in-trend glass doors, as well as additional storage. Spacious master bedroom. This home has not only a formal living room but an added family room with vaulted ceilings and fireplace with mantle. Gorgeous wooden entry door system and cozy brick porch welcome you to this home just waiting for the perfect family.